A new virus that appears similar to rabies, but has the symptoms and lethality of Ebola, shown here, has been dubbed the Bas-Congo virus. It killed two teenagers in the Congo in 2009. A virus that killed two teenagers in Congo in 2009 is a completely new type, related to rabies but causing the bleeding and rapid death that makes Ebola infection so terrifying, scientists reported on Thursday. They’re searching for the source of the virus, which may be transmitted by insects or bats. The new virus is being named Bas-Congo virus, for the area where it was found. Researchers are finding more and more of these new viruses, in part because new tests make it possible, but also in the hope of better understanding them so they can prevent pandemics of deadly disease. The virus infected a 15-year-old boy and a 13-year-old girl in the same village in Congo in 2009. They didn’t stand a chance, says Joseph Fair of Metabiota, a company that investigates pathogens. Fair is in the Democratic Republic of Congo now, under contract to the U.S. Agency for International Development (USAID) to help battle an ongoing Ebola outbreak. A few days later a male nurse who cared for the two teenagers developed the same symptoms and survived. Samples from the lucky nurse have been tested and it turned out a completely new virus had infected him, Fair and other researchers report in the Public Library of Science journal PLoS pathogens. The genetic sequences went to Dr. Charles Chiu, of the University of California, San Francisco. “We were astounded that this patient had sequences in his blood from a completely unknown and unidentified virus,” Chiu said. They weren’t expecting that. The sequencing puts this new virus on its own branch of the bad virus family tree -- somewhat related to Ebola and the virus that causes Lassa fever, another horrific killer, and most closely related to the rhabdoviruses. This family usually only infects animals with one notable exception -- rabies. But rabies is not known to cause hemorrhaging. It’s plenty horrible on its own, of course, killing virtually all patients if they aren’t vaccinated soon after infection. A nurse who took care of the first infected nurse had antibodies to the new virus. It doesn’t look like the teenagers infected one another, says Fair, but they probably infected the first nurse, who probably infected the second. Tests of other villagers have found no more evidence of the virus, however, which is good news. “Although the source of the virus remains unclear, study findings suggest that Bas-Congo virus may be spread by human-to-human contact and is an emerging pathogen associated with acute hemorrhagic fever in Africa,” the researchers wrote. Africa is loaded with nasty viruses. Lassa fever virus comes from a family known as arenaviruses and causes 500,000 cases of hemorrhagic fever a year. Crimean-Congo hemorrhagic fever and Rift Valley Fever viruses are in another family called bunyaviruses; Ebola and Marburg viruses are filoviruses that kill anywhere between 30 percent and 90 percent of victims. They’re also helping wipe out great apes such as gorillas in Central Africa. This adds a new one to the list. It worries Chiu because its closest relative is spread by biting flies in Australia. “We think that is potentially a valuable clue. This virus may have come from an insect vector,” Chiu says. “What is scary about this virus is if it does happen to be spread by insects, it has the potential to be something like West Nile." West Nile showed up in the United States for the first time in 1999, having never been seen here before. It causes regular outbreaks in Africa and parts of Europe, however, and some experts think a mosquito or an infected person carried it on a flight to New York. It’s killed 147 people in an especially bad U.S. outbreak this year, although more than 90 percent of people infected with West Nile never even know it. New viruses often cause disease -- there was severe acute respiratory syndrome or SARS, which killed 800 people and infected 8,000 in 2003 before it was stopped. Scientists are now watching a similar virus that has emerged in the Middle east. Chiu says there is not enough information to know how deadly the new Bas-Congo virus is. “It has probably been lurking out there in remote areas and causing sporadic cases of hemorrhagic fever and no one had the resources to discover it,” Chiu said. “This is probably the tip of the iceberg. I believe there are many, many more of these emerging viruses that have yet to be discovered,” he added. Fair agrees, and says his team will be looking. They’ll also be checking to see if bats or insects can spread it. “It is a frightening prospect. That is why the next step in this process is to look for the vector,” Fair said. That’s not so easy. Fair’s team and hundreds of other scientists have been looking for the reservoir -- the animal or insect source --of Ebola. That would be a bat or other creature that can carry it without getting sick itself. So far they have had no luck, although fruit bats are a major suspect. And in the meantime, there’s an outbreak of Ebola to cope with. Fair says a coordinated effort is going on, although this isn’t the worst outbreak he has seen. It’s killing about 30 percent to 40 percent of patients -- not nearly as bad as some strains, which killed up to 90 percent of victims. 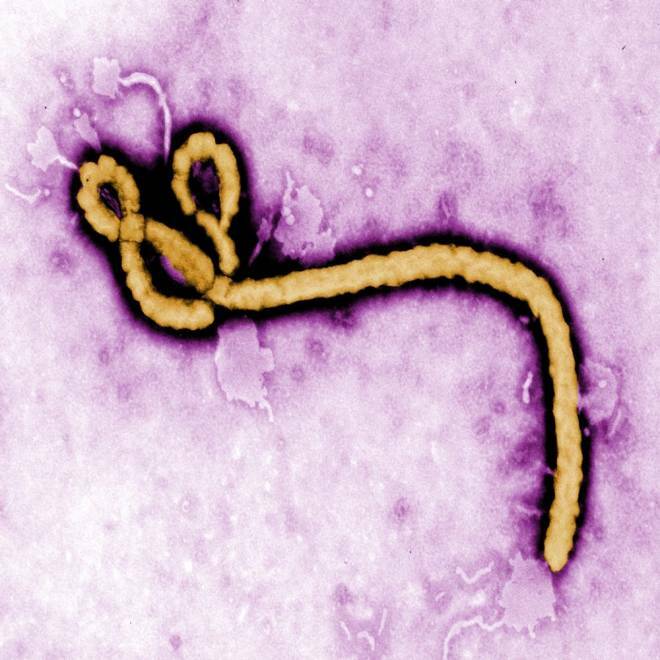 “If you had to get Ebola, this is the strain to get,” he said.